Unfortunately, the dress you are looking for (Style: AL-60184, Name: AL-60184) is no longer available. 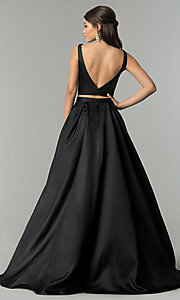 Long prom dresses get a unique twist in this sleeveless two-piece evening gown by Alyce. This beautiful designer dress features a flirty style from its eye-catching v-neckline to the hem of its full tulle-lined skirt. Thick straps transition down a sculpted bodice with a plunging v-neckline that's as feminine as it is unique. A subtle sheer inset adds a touch of coverage and modesty, while a v-shaped open back and two-piece style offer a sultry appeal. Highlighting the figure, the matching satin skirt of this long sleeveless prom dress cinches the natural waistline and softly flares out over the hips. Boasting floral-patterned embroidery and rhinestones at the convenient side pockets form the piece de resistance in this long two-piece prom dress. The model wearing black is 5'6.5" and wearing 6" heels. Top 14", Bottom 48", Hollow to Hem 59"